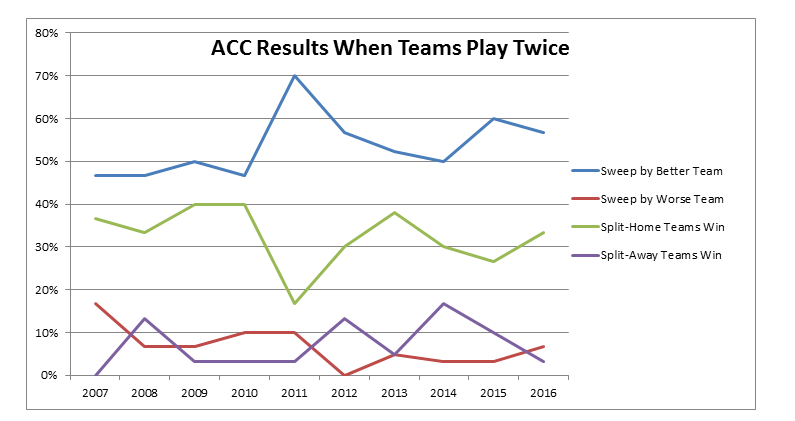 Over the past 10 seasons, ACC home teams have won approximately 63 percent of the time. 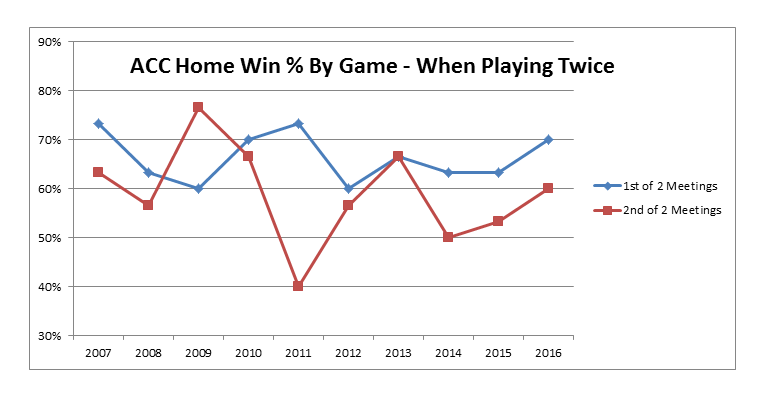 In the single-game season scenarios, the home team also wins at a rate of 63 percent. But when ACC teams play two regular season meetings, the home squad wins the first game 66.3 percent of the time but the rematch results in the home team winning only 59.3 percent of the time. In only one year (2009) of this sample did the home team win more of the second meetings. This disparity is also reflected in margin of victory — the home team wins by an average of 4.4 points per game in the initial meeting, but that edge drops to 2.7 points per game when the teams play again. So what’s going on here? The difference in home performance between the first and second regular season match-ups appears to be directly tied to the superior team performing much better in the road rematch. There are a couple of likely reasons for this. One is simply a function of time. Since the second meeting will always by necessity be closer to the end of the season, teams more closely represent their final KenPom ranking. If Team A is clearly better than Team B at the end of the season, a late February game is more likely to reflect that fact than a mid-January game. Secondly, some teams improve more than others during conference play, so it is also likely that there is more separation among ACC teams later in the year. The teams pushing toward March are not as bothered by hitting the road, more comfortable with opposing atmospheres and understanding what they are. In case you were wondering, the ACC’s most storied rivalry follows this pattern too. The home team in the Duke-North Carolina series has only won nine of the 20 regular season games of this era, but the team with the higher final KenPom ranking has triumphed 75 percent of the time. Strangely, the calendar seems to matter more than home court in this series. Duke has won 14 of the last 18 initial meetings each season, while the Tar Heels have taken eight of the last 12 regular season finales. We noticed one other interesting thing during this research — if a team loses its first of the two games at home, it is likely to get swept. Teams that win the first game on the road also pick up the return game 79 percent of the time. To sum things up for ACC squads: It’s certainly good to be home… but it’s best to be better. This entry was posted on Friday, January 13th, 2017 at 9:01 am by Brad Jenkins (@bradjenk)	and is filed under acc, feature, microsites. Tagged: acc, duke, home court advantage, north carolina. You can follow any responses to this entry through the RSS 2.0 feed. You can leave a response, or trackback from your own site.